In 2013, the U.S. Fish and Wildlife Service, Office of Law Enforcement created the Wildlife Detector Dog program in response to the toll that wildlife trafficking is taking on elephants, rhinos, tigers, and other species worldwide. In the spring of 2016, the Service deployed its second cadre of professionally trained K-9 teams. These four cadet K-9s joined the three veteran K-9 teams to sniff out illegal wildlife products at the Anchorage, Chicago, Honolulu, Houston, Los Angeles, Miami, and Puerto Rico ports of entry. These dogs, and their wildlife inspector handlers, graduated from a comprehensive training where they were trained to detect wildlife product scents (such as elephant ivory, rhino horn, and snakeskin) and exposed to work environments such as air cargo warehouses, ocean containers, international mail facilities, and U.S./Mexico border crossings. In addition, the dogs are individually trained for the most common wildlife trafficked items that are seized at their duty station. Wildlife Inspector Amir Lawal and Viper demonstrate how they’ll be checking packages for illegal wildlife on the front lines of Fish and Wildlife Service law enforcement. Photo by Tom MacKenzie/USFWS. A cargo shipment of live birds, including CITES-listed species, exported from Miami. A commercial shipment of shark cartilage powder imported from South America into Miami. In Los Angeles, numerous boxes of python skin shoes that were concealed between layers of shoes made from domestic leathers. In Honolulu, 50 pounds of CITES listed giant clam meat. In Anchorage, native American ginseng was seized before being exported from the United States. In Los Angeles, 13 taxidermied sharks comprised of four separate species. 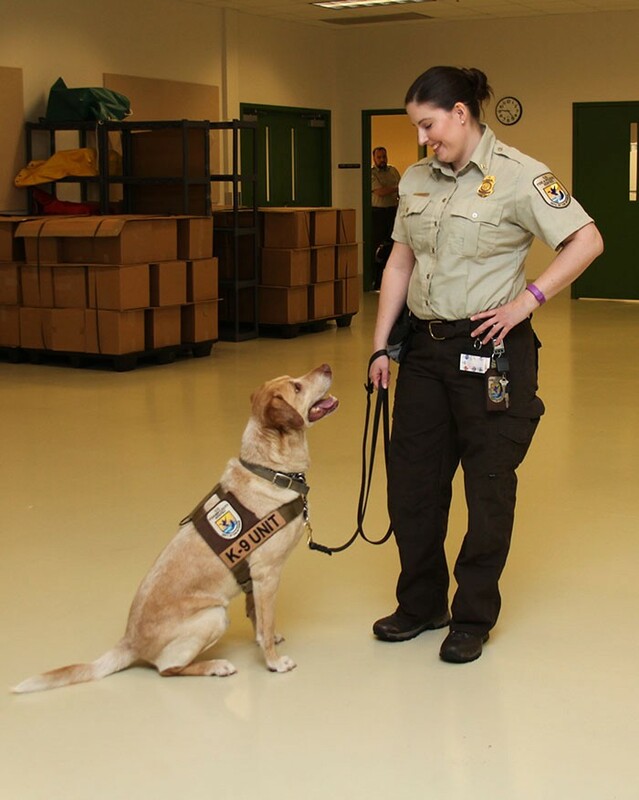 The use of dogs to sniff out hidden wildlife products expands the Service’s inspection capabilities. 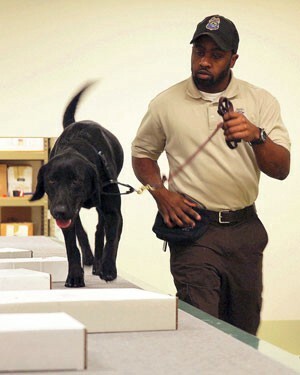 The seven dogs, and their inspector handlers, completed a 13-week training course at the U.S. Department of Agriculture’s National Detector Dog Training Center in Newnan, Georgia, before reporting for duty. OLE’s dogs were “recruited” from shelters, and abreeder, and all are Labrador retrievers or Lab mixes. For detector work, the “ideal” dog is between one and three years old, has a high food drive, and is energetic, nonaggressive, and outgoing. A detector dog’s career typically lasts until they are nine years old; however, they can continue to work as long as they are healthy and productive. The dogs sometimes alert on “animal” scents that are not wildlife (and thus not regulated by the Service). For example, in Miami, K-9 Viper responded to bovine gallstones (a high-priced and highly prized Asian medicinal).